Today (July 13), tears were shed by Joan Drinkel as she got to see her late-son's finished aircraft model for the first time. 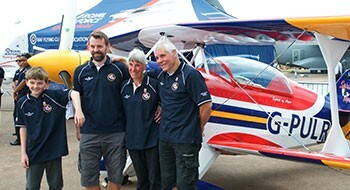 After four years in the making, the aircraft, dubbed 'The Spirit of Ayre' was unveiled to the family of the late engineer, Anthony Ayre at the Royal International Air Tattoo. Sgt Anthony Ayre was killed in a road traffic collision in 2014. A short time prior to this he had purchased a Pitts S2AE kit which he had begun building in his workshop. After his death, his mother Joan Drinkel asked if the RAF Flying Clubs' Association (RAFFCA) would accept and complete the build - a task they took in their stride. The aircraft is being donated to RAFFCA for use in its' RAF Junior Ranks' Pilot Scholarship Scheme (JRPSS) - a programme funded by the RAF Charitable Trust which helps Junior Ranks get airborne. Joan said: "I'm so overawed and grateful to everyone who has been involved, their time and effort. It's a wonderful moment. "With help from the RAF Charitable Trust (RAFCT) and the RAF Flying Clubs' Association, Junior Ranks can use the aircraft to gain aerobatics experience. Lauren Tidy, a JRPSS Scholar, said: "We're here today to highlight the fact that [RAFCT] has given us the funding to not only operate the scholarship scheme but the Tecnam aircraft for the students to learn in. "This is our way of saying thank you to the Trust for putting people in the sky and teaching them how to fly". The Ayre to Air Charity is fundraising to complete the build and get the plane operational by the end of 2018, allowing cadets and JRPSS scholars to take to the skies.